I’m still working the kinks out, flexing my muscles, easing myself back into this blog. As you are probably aware, tomorrow will see the 23rd annual Screen Actors Guild Awards telecast. Since giving my opinion on weighty matters such as who will win which of the many awards the film industry likes to hand out to themselves is one of my specialties, I’m back with my predictions. 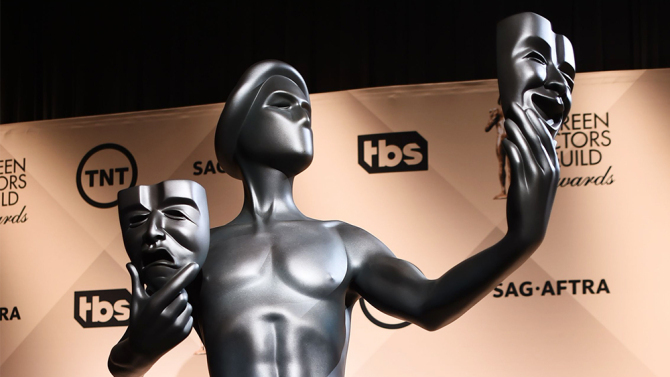 The SAG Awards and their show are all about the actors. We don’t have to waste time on the “crafts” or below-the-line names that no one recognizes and who run the show well past midnight, no matter how many times the orchestra tries to “play off” a winner who may never have this moment in the spotlight again and their over-long speech. (That was sarcasm, by the way. I’m one of those people who always stays for the credits at the end of a film. It’s the least we can do for those “below-the-line” names, without whom the film we’ve just watched could not be made.) In any case, I like the SAG Awards show. Unlike the Oscars, where everyone sits in a theater counting the minutes before they can hit the bar or the snack table, but like The Golden Globes, everyone sits at tables with their respective casts, many of whom have not seen each other since their project wrapped – unless, like the casts of La La Land or Moonlight, for example, they’ve been hitting the “circuit” together for the past few months. Food is served, if you get there on time, and the champagne flows freely. So tipsy actors get to accept awards given to them by their fellow actors. The speeches are generally the best of the major televised shows. And the show ends on time. I have to go with Casey Affleck. He’s been dominating awards season in this category. If he loses to anyone, it will be to Denzel Washington, who has never won a SAG Award. No, really. If SAG voting hadn’t already been concluded by the time Oscar nominations were announced, I might have gone with Amy Adams here, just to right the incredible wrong done to her by the Academy. But as it is, this comes down to early favorites Natalie Portman and Emma Stone. Jackie’s star has faded and I think the buzz has gone off of Portman’s portrayal. Emma Stone won the Golden Globe for Musical/Comedy and here, awarding her is a way to award the movie, since it was not nominated in the Ensemble category (because really, La La Land is a two-person film. There is no real ensemble). Again, I can’t even begin to make a case for anyone else in this category. If Viola Davis doesn’t win this, all bets are off and Chaos is driving the bus (to really mix my metaphors). This is the toughie. All of these ensembles are strong, but this award is the equivalent of a “Best Picture”. That said, the only one of these films that has not been nominated for a Best Picture Academy Award is Captain Fantastic. So on that basis, I’m eliminating it from contention here. Which still leaves four incredible films. I think the next to go has to be Manchester By the Sea (despite the fact that it is still my favorite from this group) because that movie rests on Casey Affleck’s shoulders (albeit with able assists from Michelle Williams and Lucas Hedges) and he will be recognized. This is a category packed with worthy performances. I would be thrilled if either Riz Ahmed or John Turturro walked off with this for the incredible “The Night Of”, but I picked Courtney B. Vance for the Golden Globe and while he may have lost, I’m sticking with him for the SAG. He’s already won an Emmy, so it makes sense (and usually, so does the Screen Actors Guild, even if the HFPA does not). I adore Peter Dinklage and Tyrion Lannister just like everyone else, but I’m team #JohnLithgow all the way. Dinklage will be back. Lithgow’s character won’t. I’m also a huge Kevin Spacey fan, but I’ve thrown in the towel on “House of Cards” (don’t hate). “The Crown” was just that good. Lithgow’s incredible transformation into Winston Churchill deserves to be rewarded. I am not an avid comedy watcher. I used to watch “Modern Family”, but got bored a long time ago. I think William H. Macy is an extremely talented actor, but I can’t speak to his work in “Shameless” this season. I’m going with Jeffrey Tambor, because – well – Jeffrey Tambor. Doesn’t he own this category? If SAG does love its repeat winners, then Uzo Aduba should be a lock, but Emmy keeps awarding Julia Louis-Dreyfus and SAG overlooks her. How long will this stand? I’m going with JLD. She gives great speeches. Oy! This is another tough one. A strong case could be made for every one of these series. “Downton Abbey” is done. They’ve won this award the last two years, will it win for its swan song? But again, “The Crown” is just that good. Will it split the “prestigious British show” vote? “Westworld” was fantastic and one of two water-cooler shows of the year. The other? “Stranger Things”, which could easily swoop in here and scoop this award. Throwing yet another dart, I’m going with “Game of Thrones”, which, in its sixth season, had arguably its best. I’m running out of darts. I’m going with “Veep” because it has been around for six years, consistently well-written and well-acted and hilarious. It could be overlooked because it hits a little too close to the bone right now, in which case repeat winner “Orange Is the New Black” could prevail again or a brand new winner, in “Black-ish”, one just as relevant, could be crowned. The shows on this list (and if you’ll notice none are comedies – are there ever comedies on this list?) owe a great deal to their stunt teams, but in my opinion, none more so than “Game of Thrones”. You did see “Battle of the Bastards”, right? So there you have it, my picks for the 2017 Screen Actors Guild Awards. I’ll post an update on the JMHO Facebook page with my percentage. See you next month for the Academy Awards! This entry was posted in "the Biz", Awards Shows, movies, Musings, Oscars, S. A. Young, television, Uncategorized and tagged academy awards, award shows, awards, awards season, casey affleck, Emma Stone, La La Land, Manchester By the Sea, Moonlight, sag, sag awards. Bookmark the permalink.